Egg on your shop display designers! What a shame! Someone in the display section of this major high street retailer really missed an opportunity. These egg timers have all the promise of making an eye catching product in the kitchen department. Why not try to feature them with an equally eye-catching display? Egg cups anyone? 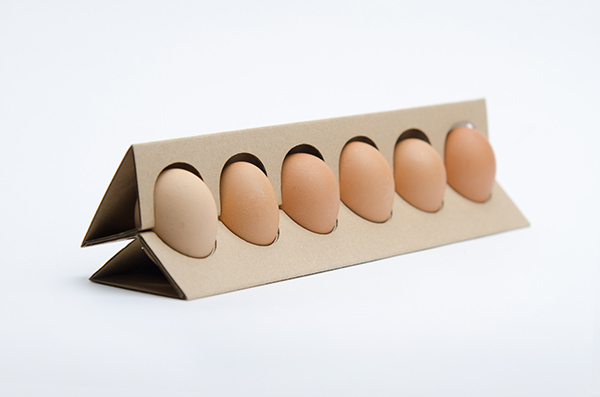 Or even better an egg box to be truly authentic with the amount of egg timers and different colours available. Branding doesn’t stop with a good product and messaging. The packaging is just as important – and if there is none in a retail environment, POS or display design takes on a crucial role in expression that brand message. Looking at the shelf now it says bright and will fly around the house. Not sure. If it was neatly displayed, and looked organised, that would be more my cup of tea. Kitchens get messy without anyone doing much of anything! If you compare this display to any of the Joseph Joseph brand, I am quite certain they would have made a feature of the holder as much as of the product. It’s one of those lovely finds my husband brought back from a business meeting – well, the photo that is, he wouldn’t have dared to get the product looking at the packaging! I guess I may have been in danger of mocking him… have a look at the picture. Anything striking you as odd? Perhaps we are not getting this but why would you use a picture of a summery dressed girl with a laptop on her bare legs (if you’ve ever held that type laptop on your skin you’ll remember how hot it gets) advertising a cosy fleece blanket – which incidentally has not been treated with fire resistant chemicals and can thus not be used on soft furnishings, such as the sofa the lady is lying on?!!??! I wonder what Alan Sugar would say to this packaging (‘does it show the product?’…) To me, it looks like a churned out product line not really caring about any brand awareness and purely targeting a ‘cheap buy’ at a motorway station, so never mind the apparent packaging inaptitude – it’s just a lovely sample of ‘what not to do’. Not hot enough? Need a blanket? Don’t use it on a sofa though!